Just in time for Easter weekend! Nostalgic Vegan Reese’s Peanut Butter Eggs! Oh the memories…! Sometimes you need an easy Easter treat that is vegan and that you know people will love. They are SO easy and very hard to mess up haha. Also, peanut butter and melted chocolate… need I say more?! Crowd-pleaser for sure. 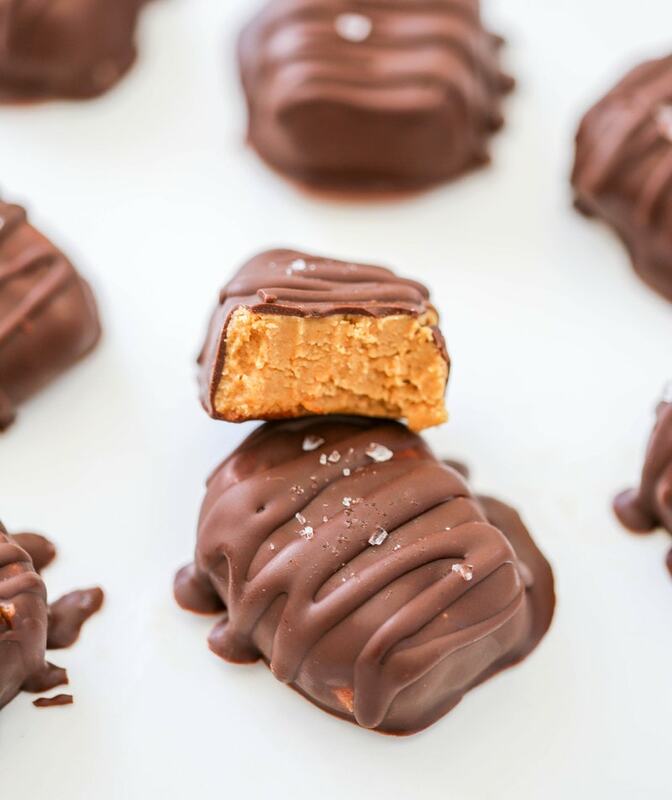 These copycat Reese’s peanut butter eggs will melt in your mouth and you’ll be craving them for days. My mouth is watering just dreaming about them… pretty sure I could eat them all in one sitting. These heavenly peanut butter eggs are perfect for a “healthier” alternative to store bought sugar-laden and processed candy or Easter treats. They don’t taste fake! They taste real and fresh and delightful. I much prefer to make my own sweet treats these days because I can control the sugar and I know exactly what is in them! Ready in 35 minutes, these sweet chocolate treats are sure to please!! You start by mixing the peanut butter, coconut flour and maple syrup (I used my favorite sugar-free maple syrup from ChocZero), until the mixture turns into a doughy-like texture. Then you roll into balls and press down to form an egg-like shape. You freeze them to set for 10 minutes. Then melt the vegan chocolate chips, dip the eggs in to drench them in chocolate-y goodness, freeze for 15 more minutes and dig in. See? Super simple. Deliciously homemade and “healthier” Vegan Reese’s Peanut Butter Eggs, using only 5 ingredients! Line a baking sheet or a flat plate with parchment paper. In a mixing bowl, start by mixing the peanut butter, coconut flour and maple syrup, until the mixture turns into a doughy-like texture. Take 1 tablespoon of the mixture and roll into a ball, then press down to form an egg-like shape. Place on the parchment paper. Recipe will make 8-10 eggs depending on the size you make them. Freeze them to set for 10 minutes. Next, melt the vegan chocolate chips in the microwave in 30 second intervals. To prevent burning, mix the chocolate in between the intervals. Dip the eggs in to drench them in chocolate-y goodness and lay flat back on the parchment paper. Freeze for 10-15 more minutes to set. Then dig in! Store in the refrigerator or freezer to prevent melting! The post Vegan Reese’s Peanut Butter Eggs appeared first on The Glowing Fridge.